A multimedia approach is always advisable when it comes to content marketing. Diversifying the media we use – across pictures, videos, text and infographics – has been shown to improve our return on investment, but data visualization goes far beyond this. Below are details of four times visualization provided the kiss of life for otherwise tired data, as well as tips on how you can incorporate the same concepts into your own strategies. 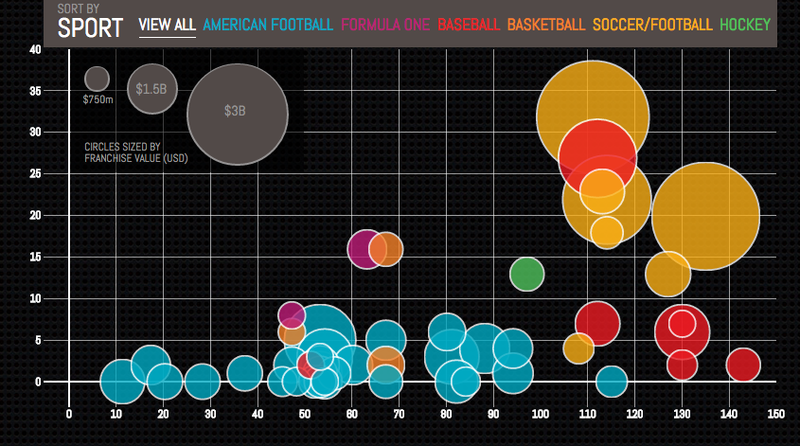 The Details: Effective data visualization is all about creating a narrative, and that is exactly what the team at Column Five did with Forbes Magazine’s Top 50 Most Valuable Sports Franchises data from 2014. They began with a simple enough concept – plotting numbers of championships won against number of years spent competing. To this, the developers added an extra dimension of information; the level of investment received by each sporting institution. It was through the convergence of these three metrics that a narrative was formed. At a glance, content users were able to understand the return on investment offered by each franchise, and also the impact that differing levels of investment have upon different sports. In business, just as in sport, investment is important but, ultimately, success is the yardstick by which all else is measured. By demonstrating precisely the level of success to be gained from each investment, data visualizers are delivering a vital narrative directly to content users. If your aim is to encourage investment and to demonstrate worth in a certain product or service, the power of this cannot be underestimated. How Can We Achieve the Same Effect? : By planning our strategies carefully and selecting which points we want to highlight, we can create the perfect narrative within our visualized data. The Details: In March of 2014, the world was dealt a shocking blow when Malaysia Airlines Flight 370 seemed to disappear off the face of the Earth. The enormity of the human tragedy involved, coupled with the realization that, yes, a disappearance like this can still happen in the twenty-first century, made the information difficult to digest. With so much data coming through thick and fast, news outlets were forced to be inventive with the way they presented these insights to the public. It is their duty to inform the public about goings on in the world, not simply in an accurate manner, but in a manner which helps them to understand. It was this idea of ‘helping to understand’ that Richard Johnston and Ben Chartoff got so right in their visualization for The Washington Post. They were commissioned by the Post to construct a graphic which explains the difficulties surrounding the search for the plane’s black box flight recorder This data visualization breaks all the rules, it subverts all the conventions that we usually attach to this kind of graphic. For a start, it is much, much, much too long. But this is the power of the team’s visualization in this instance. In their work, Johnston and Chartoff have made the scrolling bar part of the visualization’s overall effect, as the graphic reveals the relative depths of, first, an inverted Washington Monument, then an inverted Empire State Building, then – at 1600 feet – the test depth of the Seawolf-class submarine, right down beyond the wreck of the Titanic and finally to 15,000 feet; the depth of the signal detected from MH370’s pinger transmitter. In terms of breathtaking vastness and an instant understanding of the mammoth task investigators now have, this visualization is an incredible achievement. How can we achieve the same effect? : Utilizing scale in our data visualizations can provide the same level of enhancement, but deploy it carefully. Use it only when a huge level of contrast needs to be illustrated. Why’s it so Good? : Delivers real insight into buzz and social reaction at different points in the game. The Details: Social media is one of the true gamechangers of recent years, putting a wealth of marketing tools, not to mention a valuable data resource, into the hands of content marketers. We may spend hours poring over the data we receive from social media, but when we present it to our content users, it needs to be sharp, snappy and to the point. Twitter’s data team hit the nail squarely on the head during the recent Euro 2016 soccer championships in France. They plotted an interactive graph, showing the social media reaction to each of the 108 goals scored, alongside information on the timing of the goal and whether it drew the team level, made up a deficit, edged them into the lead or moved them further ahead. The result is a fascinating insight into which games and specific moments Twitter users reacted to the most strongly. Whether you are a soccer fan or not, the wider ranging implications of such a visualization are huge. Being able to map out – and then present directly – information regarding social media engagement, can be hugely valuable to marketing teams. How can we achieve the same effect? : By selecting data points that we wish to express from our social media analytics, and then plotting them in order of engagement. The Details: As humans, we like to think that we exist at the midpoint of a global conversation, taking in information from all corners and interpreting this information in real time. But at heart we still tend to be parochial beings, and it is easy to become blinkered by what is in our immediate surroundings. 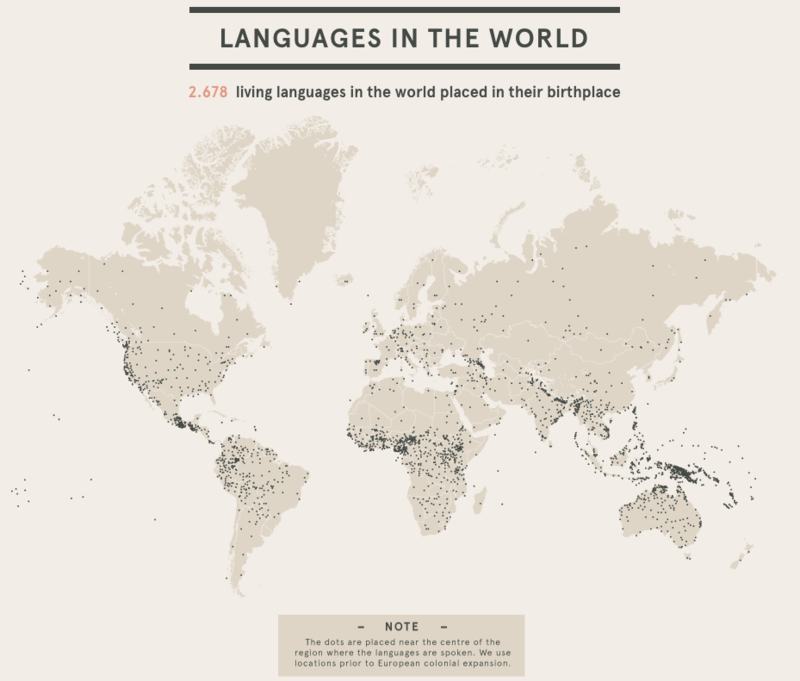 In 2013, the data visualization wizards at DensityDesign sought to challenge this, providing us with a map of the world overlaid with geographical information for the 2,678 living languages which are currently spoken around the world. As language is a vital communicative tool, its influence is formative of society and culture. In addition, as the majority of the world’s population speak with English, Spanish or Mandarin, our worldview becomes biased towards this trio of language families. What DensityDesign did is flip these perceptions, showing us a world in which there are rich bands of language formation down the western seaboard of the United States, through Central America, across Central Africa, throughout the Middle East and into the Ganges Delta, and then South East Asia and into Oceania. Recognizing that these locations are the centers for the formation of culture for millions of people across the globe, shows us how data can be subverted and used to smash previously held conceptions. How can we achieve the same effect? : What misconceptions have you found in your data? Present the necessary revisions in the form of an infographic and completely flip the script with your content.